History is said to repeat itself, first as a tragedy and then as a farce. This is happening hundred years later in case of Jallianwala Bagh centenary celebrations also. While British Parliament has discussed this event as matter raised by Indian background Parliament members and Prime Minister Theresa May had to respond by ‘deeply regretting’ the incident, but not ‘apologising’ for the British colonial Raj’s atrocities on Indian people. While we expect British colonial past to be condemned by the present British rulers, what is our response to this monumental event of the century, which became a perennial phrase for all the atrocities committed and being committed by any ruler-British and later ‘Desi’ rulers of various hues-be it Congress or now BJP! 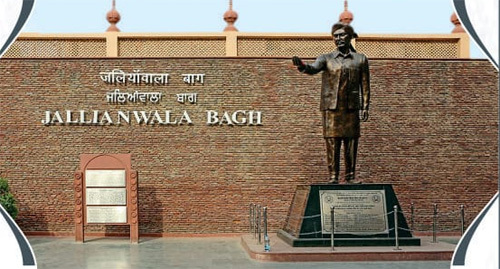 ‘One more Jallianwala Bagh’ phrase has been used for any atrocity committed by police or armed forces, sometimes used even farcically also, as for killing of a student, farmer, worker or common man. Not that the killing even of a single person is justified, but the use of such phrase as ‘one more Jallianwala’ reduces the monumental tragedy of Jallianwala Bagh to a convenient political jugglery. The background of Jallianwala Bagh goes back to 1918, when Lord Chelmsford formed a formed a sedition committee led by Lord Sidney Rowlatt, this committee discussed the increasing revolutionary activities in Punjab and Bengal especially, as Ghadar party movement erupted in 1915. Sedition committee report was submitted in April 1918 and based on that report a new oppressive act-The Anarchical and Revolutionary Crimes act of 1919, popularly known as Rowaltt act or Black act was passed in Imperial legislative council in Delhi on 10th March 1919, resisted by Indian members stoutly. It created strong reaction among Indian leaders of that time and Mahatma Gandhi, who was shaping into a national leader gave a call for strike on 30th March 1919. As the notice for strike was considered short, it was postponed to 6th April to be observed as national strike. Still on 30th March also, strike was observed in many places including Delhi, where some violence took place and in retaliation much worse police atrocities too took place. In that year Congress party was planning to hold its session in Amritsar. As Mahatma Gandhi had not visited Punjab anytime before, he took train to Punjab to reach before 6th April national strike, however after 30th March Delhi protests, he was not even allowed to enter Delhi and was stopped at Palwal and sent back. Disturbances in Amritsar and Punjab took sharp turn. 9th April was Ram Naumi day in 1919, Dr. Satya Pal and Saifuddin Kitchlew were two popular congress leaders of Punjab. With their influence Ram Naumi this year was celebrated by Hindus and Muslims jointly. This frightened British rulers as Hindu Muslim unity was earlier shown in 1857 and then in 1915 Ghadar movement. Both Dr. Satya Pal and Dr. Saifuddin Kitchlew(A Cashmere settled in Amritsar) were arrested by deceit on 10th April, they were invited for talks at Deputy Commissioner and were arrested and sent out of Punjab to some undisclosed location. This angered the general public. There were clashes with police on 11th April One British lady Sherwood was attacked as some male British officials. Sherwood was rescued, but few other British officers were killed. Protest meetings were called and 25 people died protesting on Bhadari bridge. On 13th April, a public meeting was called at 4.30 pm in Jallianwala Bagh, a common meeting place for citizenery. While General Dyer had moved from Jalandhar to Amritsar a day earlier with support from Michael O’Dwyer, Lieutenant Governor of Punjab. General Dyer took his forces to Jallianwala Bagh with only a narrow exit and without any warning to disperse, started firing incessantly on people directly. In ten minutes, 1650 rounds of firing were done and hundreds of people were turned into dead bodies in few minutes. No medical aid was provided, many people could have been saved, but the terror in whole city was such that during whole night of 13th April, people kept dyeing without water, medical aid. Only next morning people could reach the Bagh and render help to dead and half dead bodies there. Bhagat Singh visited Bagh next day and got one jar filled with blood-soaked sand of the Bagh, which is still preserved in Khatkar Kalan memorial museum in Bhagat Singh’s ancestral village. The details of tragedy are being relived in pages of The Tribune and many other papers after hundred years. Martial law was clamped all over Punjab by 15th April and General Dyer ordered crawling of citizens crossing the narrow lane in Amritsar, where lady Sherwood was attacked and rescued. Thousands of men, women, old and children were made to crawl for many yards and were flogged as well in that street for many days. In many other cities like Gujranwala, Lahore and other places massive repression took place. Poets and writers expressed the anguish of people in their writings, many of which were banned. Subhadra Kumari Chauhan, Nanak Singh, Feroz Din Sharaf and many more poets and writers expressed their anguish. Nanak Singh, who was in his twenties at that time, was in Bagh for the meeting and was lying under dead bodies, got escaped next day and aptly titled his poem Khuni Baisakhi(Bloody Baisakhi), written after a year, which was banned and has now been translated in English by his grandson Navdeep Suri. Mahatma Gandhi withdrew his Satyagraha by 19th April. Tagore renounced his knighthood given by British colonialists. People suffered for months together and generations suffered the memories of tragedy and still suffer. Many questions arise, when celebrating the centenary of such monumental tragedy. Such tragedies are norm of colonial rulers and not exception. Much worse atrocities took place in Mau Mau movement of Kenya five decades later between 1952 to 1959. Assessment of killings vary from official 11000 to three million in anther extreme. Moderate assessment is of 25000 killings. In Jallianwala Bagh official number in 379, but Congress report number is about one thousand. Ram Singh Majithia in his two-volume book in Punjabi published in sixties listed nearly 460 deaths, he even put the names and break up of Hindus, Sikhs and Muslims killed jointly during the firing. Lately Amritsar district administration have collected names of 500+ victims of massacre. British colonial administration started paying pittance of compensation after a gap of more than one year, many families never approached out of fear or lack of information. Compensation was largely paid from fifty rupees to few hundred rupees in large number of cases, whereas only in one case perhaps one lakh plus rupees were paid as compensation. The value of human life was counted as per class of the persons, poor people’s deaths were paid in just few hundred bucks, richer people’s deaths earned bit more. When there is talk of apology, present British rulers feared the demand for compensation will arise with apology. And why should the demand not arise? Few years ago, a British court has ruled British Government to pay millions of pounds to survivors or decedents of Mau Mau movement. Why Jallianwala Bagh be treated differently, successors of colonial rulers must be made to pay for their systemic crimes. Colonialism was a system approved by successive Parliaments of Britain and continuity demands the compensation from present rulers as well Rulers don’t pay from their pockets, they pay from public funds and Brittan as colonial power had squeezed Asian and African colonised countries ruthlessly to enrich British ruling classes or British bourgeoise , a part of return of colonial loot is totally justifiable and just action, as done by a British court. But do the Indian ruling classes have the guts to ask for compensation for British colonial crimes? Indian ruling classes don’t give much importance to Jallianwala Bagh historic tragedy as supreme symbol of Indian freedom struggle, otherwise how come that for centenary celebrations, head of the state-President of India is not going there. Sending Vice President for the centenary function is just undermining, even disrespecting the significance of the monumental tragedy. Not only that, Indian ruling classes are following British colonial practices, a ban has been imposed in Amritsar and Jallianwala Bagh for the free movement of people to pay homage to martyrs of Jallianwala Bagh. Many peasant, workers, student and youth organisations have planned marches to Jalliawala Bagh monument, which has been put to restrictions. Tragedy of people has been turned into celebration of VIP’s. And further more, Indian ruling classes are continuing with such oppressive laws as Rowlatt act after a hundred years of the tragedy. British colonialism was forced to withdraw that act in three years. Rowlatt act was withdrawn by 1922, but what about DIR, MISA, UAPA and AFPSA continuing for decades in ‘desi’ rulers ruled India. Was not Bhagat Singh correct in observing that it hardly makes any difference if Purshottam Das Thakkar or Sir Tej Bahadur Sapru become Viceroys in place of Lord Reading or Lord Irwin, if the system of oppression and exploitation continues and who can say that system of exploitation and oppression has ended with British rule. Worse still the communal cauldron is made to burn, a Lok Sabha candidate Kanhaiya Kumar has alleged that RSS/BJP is trying to stoke Hindu-Muslim riots in 2019 Ram Naumi falling during elections and you see 1919 April Ram Naumi celebrated jointly by Hindus and Muslims in fervour. Muslim even served sweet water to their Hindu brethren during the festival. Dr. Saifuddin Kitchlew and Dr. Satya Pal were the symbols of Hindu-Muslim unity and brotherhood during national movement and that unity and brotherhood is put to danger by so called ‘nationalists’ of 2019! Have we really learned lessons from-Jallianwala Bagh-the monumental tragedy! Chaman Lal is a retired Professor from JNU.